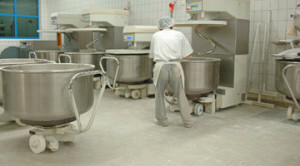 High-volume food & beverage processing plants present a unique set of challenges when it comes to facility flooring. With constantly-wet settings, temperature extremes, and frequent high-pressure hosing, food & beverage processing facility flooring has to withstand serious punishment. On top of the harsh chemicals and heavy wear to which these floors are subjected these finishes must also support safety and sanitation regulations administered by agencies like the USDA, FDA, OSHA, and others. Facilities need USDA-approved concrete coatings to help them pass rigorous inspections. No plant can afford to shut down, or to replace its flooring on a regular basis. So what considerations should you take when choosing the best flooring for your food & beverage processing facility? Is the flooring system moisture-tolerant? Can it be installed directly onto a damp concrete surface? Does the high-performance resinous flooring withstand the specific chemicals, acids, alkalis and temperatures in your food processing plant? Can the flooring material be sloped to drain, with an integral cove-to-wall base for easy wash down? Does the flooring expand and contract at a rate close to that of concrete? Will it stay well-bonded during extreme temperature fluctuations? Does the proposed turnaround time work with your production schedule? Does the floor have antimicrobial properties throughout? Is slip resistance available, and can it be adjusted for different areas of the plant floor? Can decorative elements, like colored chips or colored quartz blends, be incorporated for select areas? Does your supplier offer USDA-approved concrete coatings? Vegetable oils, animal fats, dairy products and sugars all contain acids that can eat away typical epoxy flooring. Other operations expose floors to high concentrations of salts and alkaline compounds. Additionally, some food processing chemicals, harsh cleaners and disinfectants contain industrial solvents. 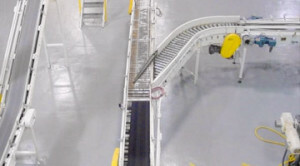 Food & beverage processing facility flooring also takes physical punishment from heavily loaded, steel-wheeled carts, dragged crates, forklifts and more. Ultimately, these facility floors must be capable of surviving some of the most extreme conditions around.